(CNN) -- The European Commission found leading computer chipmaker Intel guilty Wednesday of violating European anti-trust rules and ordered that it pay a fine of 1.06 billion euros ($1.45 billion). It is the largest fine the commission has ever imposed, said Neelie Kroes, the European commissioner for competition. Intel has said it plans to appeal the decision. The commission found Intel abused its dominant market position in the market for computer chips known as the x86 computer processing unit (CPU), Kroes said. The abuse lasted more than five years, she said. "Those x86 chips are the engine of the car, so to say," Kroes said at a news conference in Brussels, Belgium. "Your computer won't work without these chips." 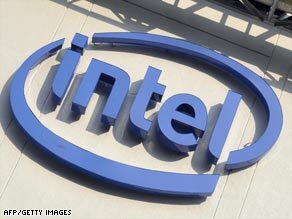 Intel held a 70 percent share of the market during the period of the violations, she said. "That Intel had such a large market share is not a problem in itself," Kroes said. "What is a problem is that Intel abused its dominant position. Specifically, Intel used illegal anti-competitive practices to exclude essentially its only competitor, and that reduced consumer choice -- and the whole story is about consumers." Intel's actions frustrated innovation and reduced consumer welfare, Kroes said. The commission found that Intel awarded major computer manufacturers rebates on the condition that they purchase all or most of their supplies from Intel. Intel also paid Europe's biggest computer retailer, Media Markt, to sell Intel-based PCs exclusively, the commission found. Media Markt has some 200 megastores in nine countries. The commission also found that Intel awarded payments to computer manufacturers so they would postpone or cancel the launch of products containing parts from its leading competitor, AMD. "The commission found that these payments had the potential effect of preventing products for which there was a consumer demand from coming to the market," the commission said in a statement. "Given that Intel has harmed millions and millions of European consumers by deliberately acting to keep competitors out of the market for more than five years, the size of the fine should come as no surprise," Kroes said. Intel was allowed to present a defense to the commission's preliminary conclusions. But Kroes said the company "went to great lengths" to cover up its anti-competitive practices, resulting in a long and complex investigation. In a statement on the company Web site, Paul Otellini, Intel's president and CEO said the company took strong exception to the ruling and planned to appeal. "We believe the decision is wrong and ignores the reality of a highly competitive microprocessor marketplace -- characterized by constant innovation, improved product performance and lower prices," Otellini said. "There has been absolutely zero harm to consumers. He added that the compnay did not believe its practices violated European law and accused the Directorate General for Competition of the Commission of ignoring or refusing to "obtain significant evidence that contradicts the assertions in this decision." Otellini added that the company had never sold products below cost but had invested in innovation, manufacturing and developing leadership technology with the result that it could "discount our products to compete in a highly competitive marketplace." "Despite our strongly held views," Otellini concluded, "as we go through the appeals process we plan to work with the Commission to ensure we're in compliance with their decision."